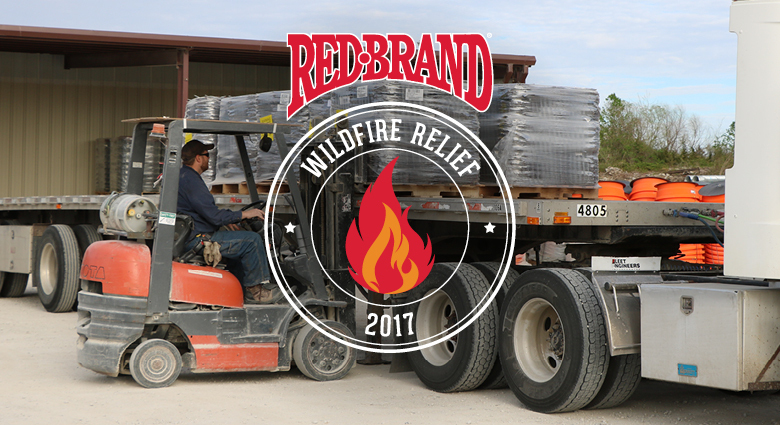 Red Brand is gearing up to assist victims of last week’s devastating wildfires in the states of Colorado, Kansas, Oklahoma, and Texas. With the destruction of nearly 2 million acres of farm and ranch land, the death of hundreds of thousands of livestock, and the tragic loss of human life, Red Brand executives have reinstated The Red Brand Wildfire Relief Program. The initiative was created last year in response to the historic Anderson Creek Wildfires in Kansas and Oklahoma. We are saddened by the tremendous amount of loss. Red Brand wants to support those affected with the recovery efforts so they can get back to normal as soon as possible. Fortunately, Red Brand is poised to assist with the immediate need for fencing products. We already have a substantial amount of product on the ground at local dealers, and we’re ready to ship more where needed. Red Brand understands that having product on hand is part of the solution. However, clearing destroyed fence lines and replacing those fences with new product takes time and manpower. The Wildfire Relief Program is an FFA service project created to challenge members to mobilize volunteers. By partnering with local chapters, Red Brand encourages FFA members to seek out neighbors (near or far) that need help with fence tear out or rebuilding. In return, Red Brand will donate up to $500 to the FFA chapters that coordinate these efforts. We heard from grateful neighbors last year. They were truly touched by the hard work and dedication of the FFA volunteers who helped restore their properties in Kansas and Oklahoma. And, we also heard from grateful FFA advisors who appreciated the chance to serve. This program is a unique opportunity to make a difference. We encourage FFA members to come together to help communities while earning funds for their chapter. It’s a win-win for all involved! Up to $500 donated to organizing FFA chapter (amount to be determined by Red Brand, based on the scope of the project). Teams of FFA volunteers can provide free labor. In addition, consumers and contractors can take advantage of various rebate offers through Red Brand. Farmers and ranchers can benefit from cost savings on qualifying fence products through participating Home Grown dealers or NTRA membership. Contractors enrolled in the Red Brand Certified Fence Installer program are also entitled to savings. More information on these programs can be found at our website. For details on how to get involved with the Red Brand Wildfire Relief Program, contact Dain Rakestraw, Red Brand Marketing Manager, at rakestdn@keystonesteel.com or 309.697.7063. Information will also be available at redbrand.com. You can also follow updates on our Facebook page. Don’t miss a thing. Simply fill out the Subscribe form here. We’ll notify you every time we add new material. See you soon! Welcome to The Red Brand Post, an online home for farmers, ranchers, homeowners, and ag professionals. The Red Brand Post is your go-to source for all things related to ag fencing. Congresswoman Bustos Tours Keystone Steel & Wire Co.